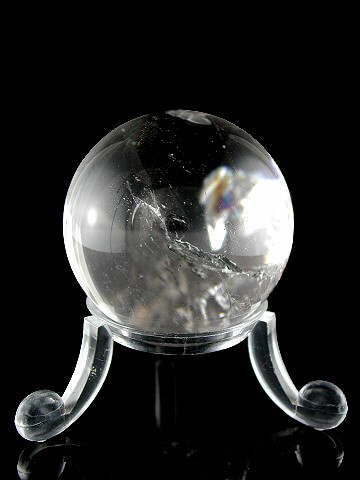 Exceptional quality Clear Quartz sphere with a beautiful rainbow at its heart. This is a 'Quality 1' (top notch) Clear Quartz sphere and is exceptionally clear. It's energy is dynamic and fast-acting and it has a beautiful, light-bearing rainbow inside so it contains all the colours of the healing spectrum. At 1 3/4in across (40mm), this sphere is the ideal size to sit in your hand for meditation, scrying, healing, re-energizing, to assist in Reiki or you could just sit it on your window sill and let it emit its gorgeous energy into your home or environment. When sunlight hits its surface, it appears to 'light up' from the sun's energy - it really is a super sphere. Clear Quartz has six principle properties. It can structure, store, amplify, focus, transmit and transform energy on every level. This is reflected in some of the different formations found such as channeller crystals, transformation crystals, double terminated crystals, laser crystals and so on, Clear Quartz, however, is the only truly ‘programmable’ crystal known to man. This means that you can get a piece of Clear Quartz to ‘take on’ the attributes of virtually any other crystal. If you had a bed of this amazing and versatile crystal, and placed a piece of Amethyst on it for a period of time, it would start to pick up the energies of the Amethyst. This does not, however, produce a permanent change. You can also programme and dedicate pieces for chosen healing missions. For example, a healer or therapist could send a client home with a piece, programmed to continue the healing process started during the treatment session. Each week or fortnight, when they return, it can be cleansed and re-programmed. The clearer the piece of Clear Quartz, the more masculine (Yang) energy it has. This type also tends to have stronger, faster acting energy. The milkier specimens are more feminine (Yin) in energy and are better suited to long-term or chronic conditions. This sphere is exceptionally clear, giving it a very dynamic Yang energy. Clear Quartz is superb for cleansing, activating and charging all Chakras, and can be used to draw out pain from the physical body, making this size sphere ideal for any such work.